If you know me at all, then you should know that I love all things cream cheese. And if you know my mom at all, then you should know that she has ZERO tolerance for following finicky directions. 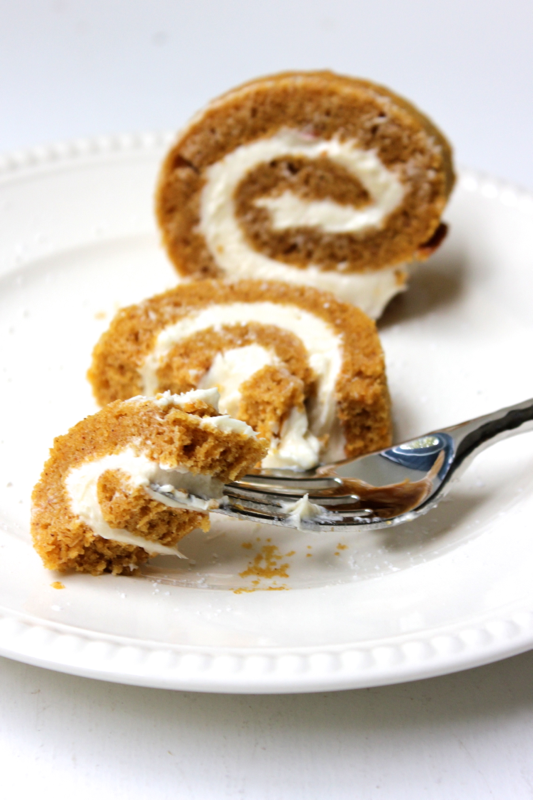 So when she made this pumpkin and cream cheese pinwheel cake and sent me a picture, I drooled. But when she proceeded to make three more cakes to satisfy everyone who clamored for a slice, I was in awe. Upon her urging, I made this pinwheel cake for myself, and, despite its polished appearance, it is quite simple. And the cream cheese swirl is SO delicious!! To make this showstopper, preheat your oven to 350º F. In a bowl, whisk together 3/4 cup of flour, 1/2 teaspoon of baking soda, 1/2 teaspoon of baking powder, 1 teaspoon of cinnamon, and 1 pinch of salt. In a separate bowl, whisk together 3 eggs. 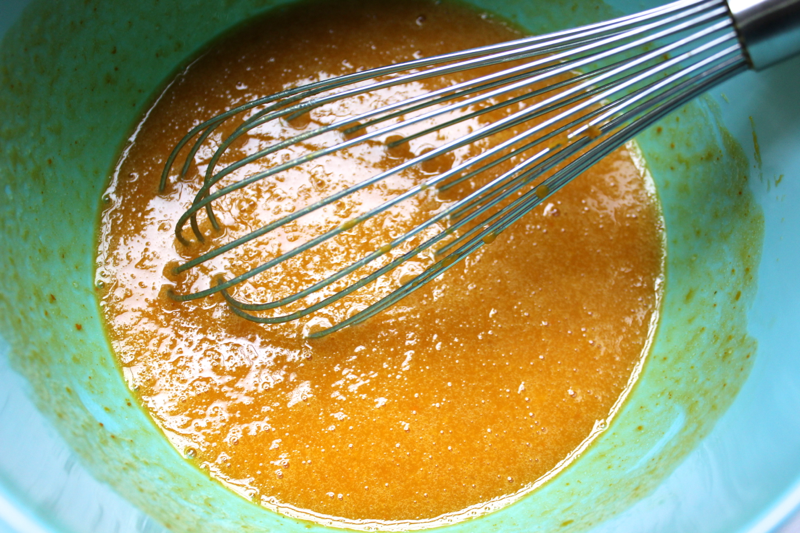 Then, whisk in 1 cup of sugar and 2/3 cup of pumpkin purée. 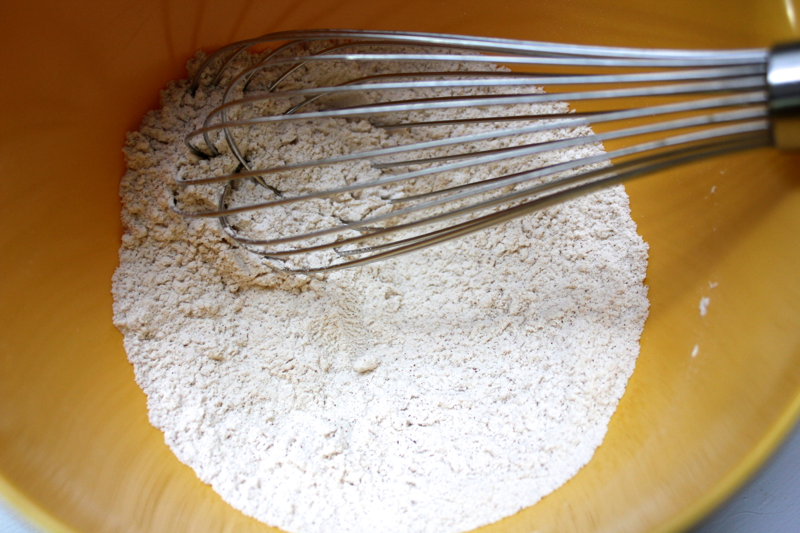 Dump the dry ingredients into the wet ingredients, and whisk them together. Grease a 17.25 by 11.5 inch sheet pan. A slightly smaller pan would probably work ok, but a larger one would not. 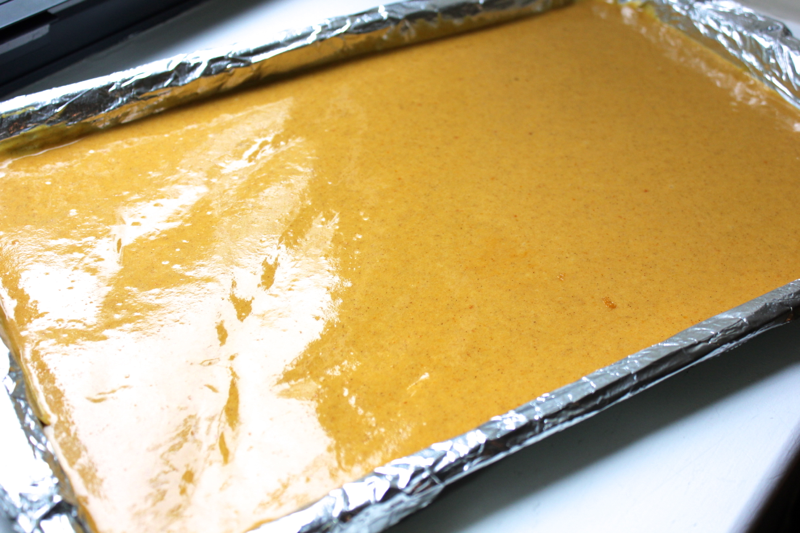 Then, pour the pumpkin cake batter onto the pan, and spread it out into an even layer. My cake batter was spread so thinly that all of my cooking instincts were screaming at me. My instincts were wrong, and the cake turned out just fine. 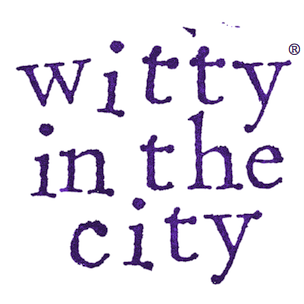 Bake the cake for anywhere from 9-15 minutes until the cake is fully cooked. A toothpick inserted into the thickest part should come out clean. Rip a large sheet of wax paper, and spread it out on a flat surface. In one fell swoop, flip the hot cake over onto the wax paper. 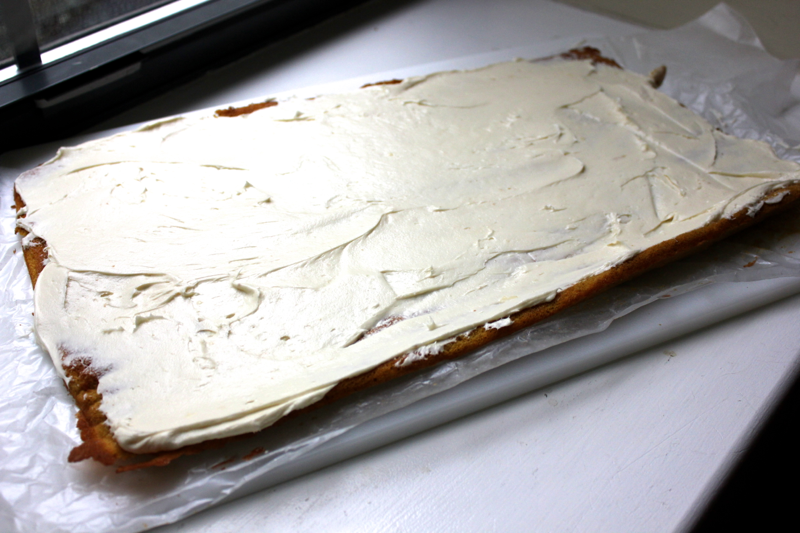 Roll the wax paper and the cake up, starting along the cake’s long edge. 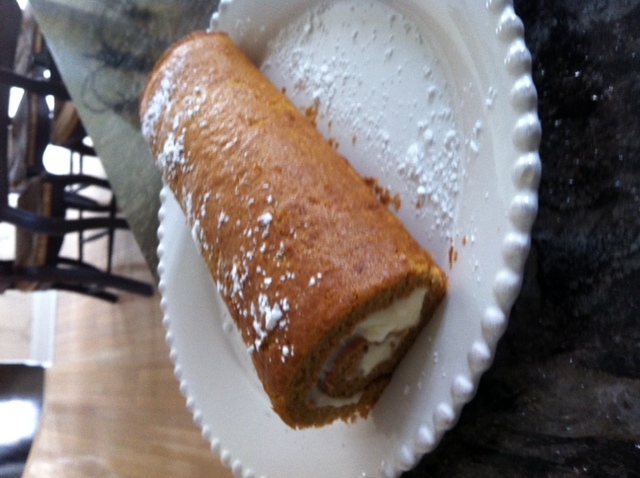 Put the rolled cake into the refrigerator to cool for about 45 minutes to 1 hour. This process helps the cake take on a rolled shape without breaking. While the cake cools, prepare the cream cheese filling! 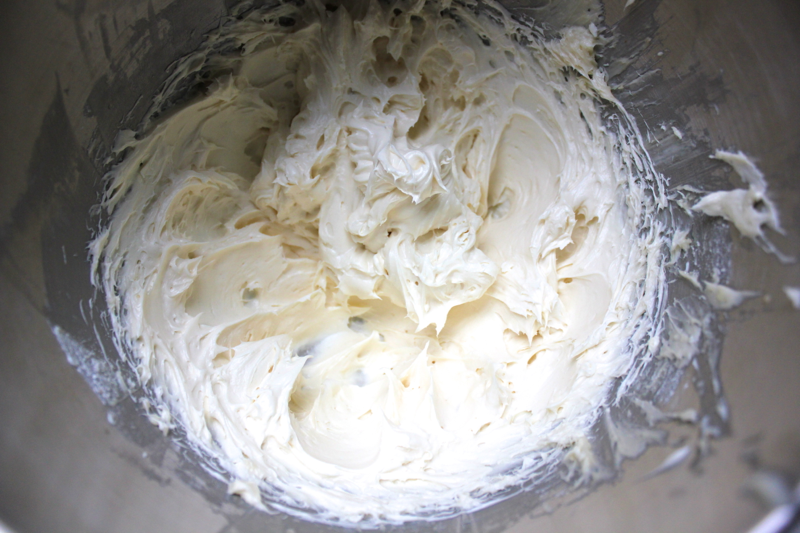 Using an electric mixer, whisk together 1 brick (8 ounces) of room temperature cream cheese, 6 tablespoons of room temperature butter, 1 cup of powdered sugar, and 1/2 teaspoon of vanilla extract. 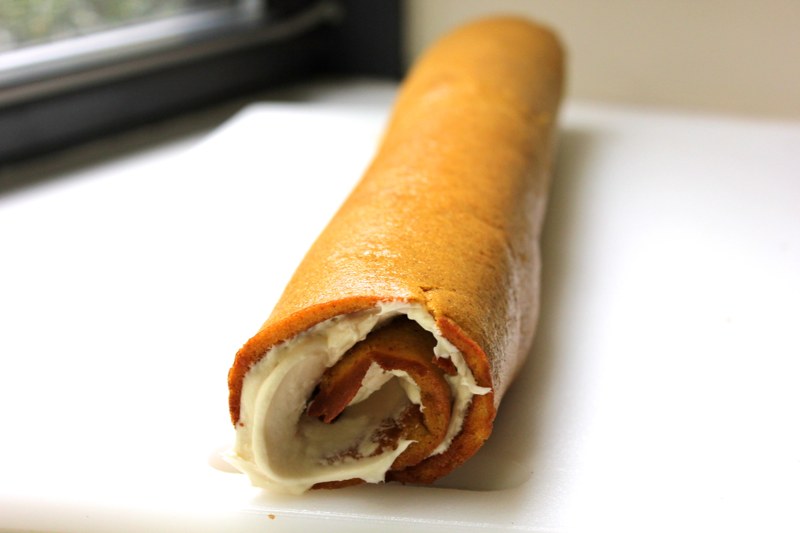 Taste the cream cheese filling, but use self control to keep from eating it all before it ever meets the cake. When the cake has cooled, unroll it. Dollop the cream cheese filling onto the cake, and spread it in an even layer. 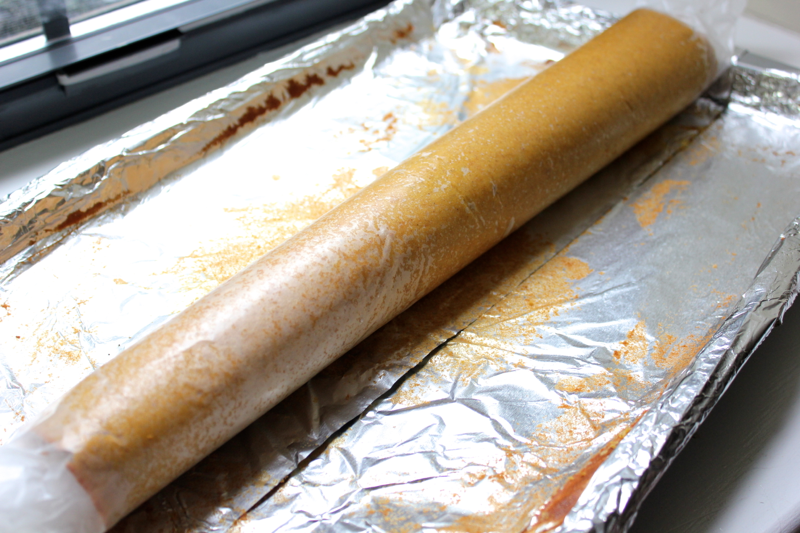 Roll the cake back up, starting at the same long edge that was rolled before. 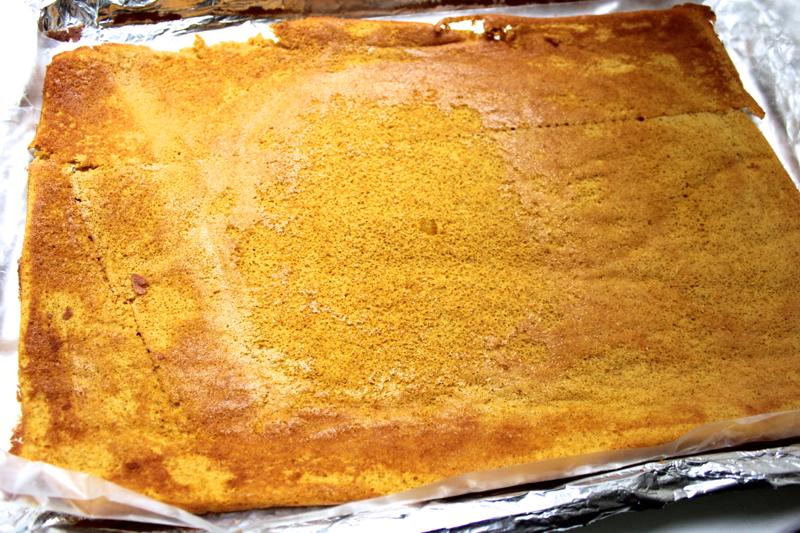 Dust the top of the cake with powdered sugar, and then cut it in half. Now you have two, generously-sized cakes! 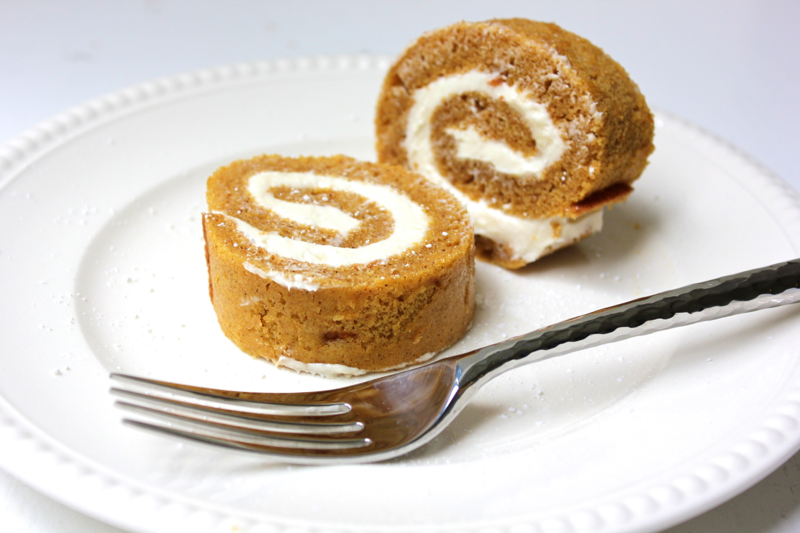 Cut slices of the pumpkin pinwheel cake to enjoy. I like keeping this cake in the refrigerator because I prefer my cream cheese when it is chilled. I also think that a slice would be great toasted in the oven because I prefer my cream cheese when it is warm and melty. I guess I like cream cheese however it comes, so give me another slice of this cake! Fall speciality. Love it and love u!!!!! I made the pumpkin chicken thigh recipe recently and thought it could be improved. I took the recipe offline while I work on it. 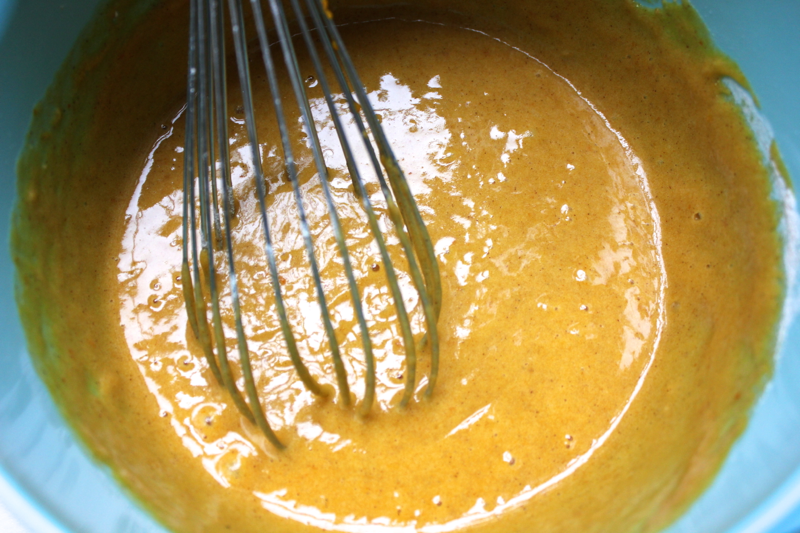 If you want to make it in the interim, the recipe is as follows: Whisk together 1 cup of pumpkin purée, 1 cup of chicken stock, 1 teaspoon of brown sugar, 1 teaspoon of maple syrup, 1/2 teaspoon of cinnamon, 1/2 teaspoon of red pepper flakes, 1/2 teaspoon of garam masala, salt, and black pepper. Pour the mixture over 6 salted and peppered boneless, skinless chicken thighs in an 8×8 inch baking dish. Bake at 450 for 40 minutes. Serve with the sauce spooned over top. I’ll try to get a revised recipe back up soon!